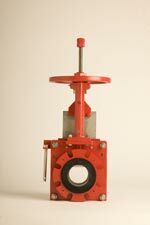 The Series DX Slurry Knife Gate Valve is designed for heavy slurry applications in the power and mining industries. When the valve opens, the reinforced elastomer sleeves seal against each other and provide a 100 percent full port opening, minimizing turbulence and wear. The seats isolate and protect all metal parts from the process. Each time the strokes, the valve discharges a small amount of slurry, keeping the gate path and seat area clear of entrapped particulates.